As companies rush to adopt inbound marketing strategies to fuel their sales teams with a steady supply of inbound leads, outbound tactics are taking a backseat in terms of budget and effort. But was that really the intention of inbound marketing? Should we eliminate outbound altogether? We’ll answer a few of these pressing questions here. Was the intention of inbound to eliminate outbound? Absolutely NOT! 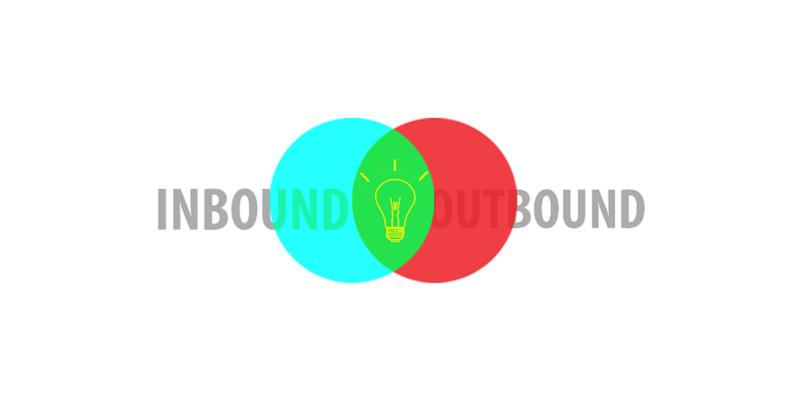 Many think outbound is simply opposite to inbound, but really it’s like comparing apples and oranges. The conversation should move from inbound vs outbound marketing to a discussion on how to incorporate both efforts. If inbound replaced outbound, we would be setting up call centers and low paid order takers and maybe even replacing sales professionals with shopping carts. However, this is simply not the case for B2B organizations and nor do we think we’re heading there anytime soon (phew!). Inbound does however shift the traditional company growth funnel in a very big way. Without inbound, outbound is virtually dead. The biggest impact inbound brings to companies is in the top and middle part of the funnel. Inbound marketing strategies are filling the funnel at a significantly higher rate and lower cost than outbound strategies. Cold calling, print mail, high volume tradeshow tours, cold email blasts, and annoying advertising campaigns (pop-ups) are not generating the leads needed to support the bottom part of the funnel (closing). Today’s buyer is one that is risk averse and simply does not want to be interrupted by a cold call or promotional email. Not only are they not interested in this form of communication but they are getting really savvy at blocking these messages out. Educational articles, e-guides, worksheets, videos, and really anything that is helpful and interesting to our audience are what attract new leads, conversations and an overall healthy funnel to support sales. But let’s not rule out outbound approaches in the top and middle part of the funnel either. While blind cold calling and unpersonalized email blasts are ineffective, successful outbound marketers and sales professionals are blending the inbound approach with their outbound. The core principle of inbound is to “always be helping” (ABH), but also identify who can be helped and when. Outbound leverages an ABH philosophy and rather than focusing on a high volume of calls/emails to fill the funnel, they’re opening dialogues with already engaged contacts brought in by inbound marketing. One key difference in today’s successful outbound approach is the ability to have a dialogue with a buyer without promoting your brand or solutions until the buyer has indicated they are deciding between solution options. Outbound is still very much relevant and here to stay. Without outbound, inbound can’t live to it’s full potential and without inbound….well then you’re just plain cold calling. Not convinced yet? Take a look at some of these charts that highlight the effectiveness of incorporating an inbound marketing strategy to your playbook.